I met with Justin and Stephanie several times to plan out the photographs for their big day. We settled on bringing a little Crown Point hometown flavor to their wedding day with a first look at the Lake County Fairgrounds. I positioned Stephanie deep inside The Old Covered Bridge with Justin facing out. We would have her slowly make her way to him and let the anticipation build. The groomsmen and bridesmaids were cheering them on behind me. The bride and groom's first look at The Old Covered Bridge at the Lake County Fairgrounds in Crown Point, Indiana. Bride and groom see each other for the first time at The Old Covered Bridge at the Lake County Fairgrounds in Crown Point, Indiana. This was my second day in a row with a first look involving a bridge. They were both special moments and I think we got some really unique wedding photos from both days. Stephanie's day started with getting ready at her parent's home in Schererville, Indiana. I spent the morning with her family taking detail shots and documentary style wedding photography. The bride gets make up applied at her parent's home in Northwest Indiana. The bride's wedding bracelet sits upon her purple wedding shoes. Her family was very welcoming to myself and my assistant. We had a great time interacting with everyone and could have hung around all day, but soon it was time for Stephanie to get into her wedding dress and we would then meet the wedding party in Crown Point. The bride's sister helps tie the wedding dress. The bride shows off her dress on her wedding day in Schererville, Indiana. The bride's mom and sister help her into her wedding dress. After the first look we gathered up the wedding party for some group shots in front of The Old Covered Bridge and all around the Lake County Fairgrounds. The entire wedding party has their photo taken in front of the the Old Covered Bridge at the Lake County Fairgrounds in Crown Point. Stephanie is an avid runner and often would use the fairgrounds for her workouts. She wanted to use the various piers and gazebos within the grounds. This one overlooking the lake is one of my favorites. The bride and groom kiss at the edge of a pier inside the Lake County Fairgrounds. Our final stop before going to the ceremony was the downtown Crown Point Square where we took this beautiful portrait of the bride in front of the old courthouse. Portrait of a beautiful bride in downtown Crown Point at the old courthouse. The outdoor wedding ceremony took place at the Halls of St. George in Schererville, Indiana. Rain was threatening, but stayed away as Stephanie and her Dad walked down the aisle with friends and family looking on. Bride walks down the aisle with her Dad at an outdoor wedding ceremony at the Halls of St. George. Family sits in chairs at an outdoor wedding in Schererville, Indiana. The outdoor ceremony had many fun moments with the Reverend Doug Kluuken once again presiding over the nuptials. One of my favorite moments was when the bride and groom were walking out and the music kicked in with Crazy Little Thing Called Love from Queen. The newly married couple were bouncing their way back down the aisle. A fun moment at an outdoor wedding at the Halls of St. George. A newly married couple celebrates as they walks down the aisle at their outdoor summer wedding at Halls of St. George. Dancing in the spacious reception hall had the guests and the bride and groom moving all night long. 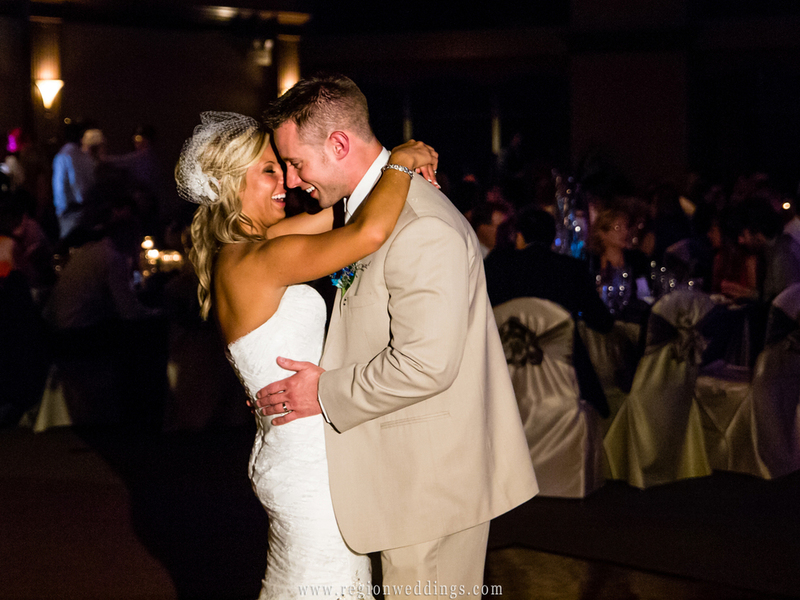 The bride and groom take their first dance at The Halls of St. George in Schererville, Indiana. Line dancing during a wedding reception at the Halls of St. George. 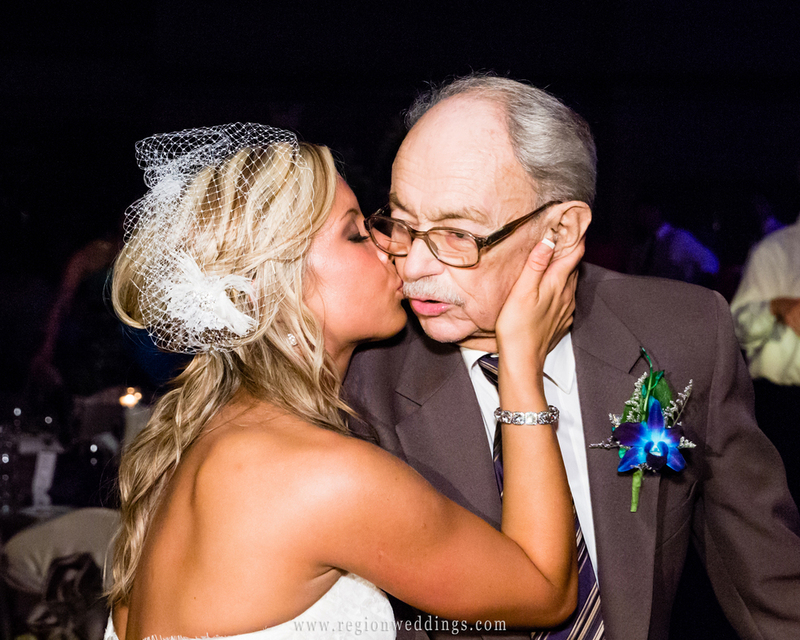 The bride gives her grandfather a kiss after he surprises her on the dance floor. I hope you have enjoyed this sneak peek detailing Justin and Stephanie's first look at Lake County Fairgrounds as well as their outdoor wedding at the Halls of St. George. Stay tuned here and at the SBV Photography Facebook Page for more images and updates. The bride and groom kiss as their bridesmaids spell out the work love with sparklers.